Developed by Dolav 40 years ago they were over engineered when compared with standard plastic pallets boxes so they can last for decades. The name ‘dolav’ is now used as a generic description for other pallet boxes made in wood, steel or plastic but only those made in HDPE structural foam by Dolav are genuine Dolavs. Hugely successful in the UK, Europe and other global markets, the Dolav company and its latest product, the 1200 x1000 Ace, are widely used throughout the food processing, manufacturing, recycling and waste handling sectors. New Ace applications include use in high-speed cold chains where single, solid-wall Dolavs offer some 7-10% more payload by being lighter than the old-fashioned, heavy and now, often unnecessary, insulated boxes. Many pallet box pooling and hire companies select the Dolav Ace for its strength and return on investment. As designed, it has proven not to be brittle in cold stores. Dolav plastic pallet boxes are designed to operate in -40 to +60 deg C. Another ‘acid test’ is that in many lead-acid automotive battery recycling businesses, the Dolav Ace is known as the ‘Battery Ace’. An accolade like that has to be earnt. The Dolav Ace has earnt it. 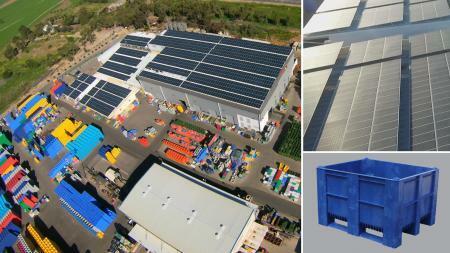 Now made with 10% solar-power produced electricity, Dolav pallet boxes have always been recyclable. End of life boxes are ground down and returned to the Dolav factory to be made in to wheelie bins. The recycled plastic is then set for decades of use in domestic waste recycling. Dolav Factory with its huge solar panel array.